What to drink with Spanish ham? 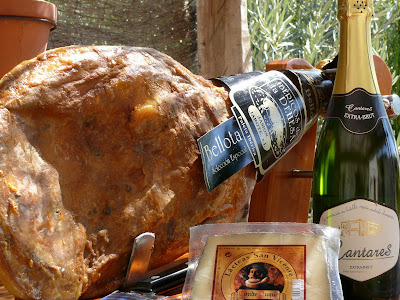 So what is the best thing to drink with Serrano ham? Well, that all depends on who you ask! Some of the best chefs in the region will all give a different answer so; we know it is down to personal taste. There is however, a general consensus that Red wine, Fino and Beer are the more complimentary three beverages that are best served up with a plate of Serrano ham. Red Wine: A perfect pair? Red wine compliments thinly sliced Serrano ham very well indeed. As with cheese a good red helps conjure a treat for the senses. Rioja is popular but for this pairing any good red wine will do, no matter which region it is from or age. This combination also opens the door to invite olives and cheese into the equation, even a little olive oil, or perhaps some salted almonds too…? Lovely tapas. White wine: White wine is a less obvious drink to be enjoyed with Serrano ham. In summer though a cool glass of white wine goes down well with slices of ham. Serrano ham salads for example are popular in the summer with white wine for a light lunch. The pair together do compliment each other; with the addition of some olives a real summer flavour can be produced. Young white Riojas work best. Fino/Manzanilla: We found these two Spanish specialities to be by far the most popular choice. Ice cold fino or manzanilla sherry wine goes with sliced Serrano ham like nothing else. The combination of flavours work so well that even after a good red wine it should be an easy decision for the future! Fino and manzanilla work well with the majority of Spanish cured meats, why not indulge and serve up some cured lomo tenderloin along side your Serrano ham with a drizzle of olive oil… Perfection. Brandy: Brandy does deserve a mention here although it is not an obvious one. A good cognac does compliment a strong ham but really comes into its own when cooking. Slow cooked brandy chicken with Serrano ham is a good example of some very agreeable Spanish flavours, the strength of the ham with the underlying tones of the cognac work exceptionally well. There's life in the old blog yet! 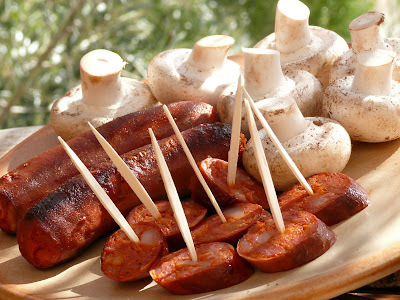 Even though we have moved our tapas recipes to Top Spanish Tapas this old blog seems to remain popular so we thought you should know about the new recipes, tapas newsletter and new products from the Spanish deli. If you haven't seen the Spanish deli yet why not pop in and take a look, loads of Spanish recipes, tapas ideas, tapas & paella kits, world famous Spanish "jamones" serrano and iberico, articles...the list goes on! Welcome to the home of Spanish food and Andalucian ceramics. Need to discover more? Why not pop into the online deli at Orce Serrano Hams, we are based in rural Granada and dispatch your order direct from southern Spain.